« Ready for Dessert – Now in Paperback! I can’t believe that after all these years, I’ve never made white bean dip. I’ve made dips with eggplant, chickpeas, eggplant again, and even weeds, if you can believe it. I don’t know, it always seemed like it would be too plain, or ho-hum. A mound of puréed beans? No thanks. But boy, was I wrong. First up, of course, are the beans. There are good beans and there are not-so-good beans. The good ones are fresh and buttery tasting. The not-great ones are old and stale. Who knew that dried beans went bad? Dried beans generally have a shelf life of about one year and if you’ve ever tried to cook up a batch of dried beans and they’ve remained stubbornly tough, it’s usually because they’ve been hanging around too long. I had a bag in my pantry since, well, I can’t remember when I bought them. So as we say in the restaurants business, “Use ’em or lose ’em” – so if you’ve got some beans in your pantry that you keep pushing aside, as I was (to reach for the chocolate) now is the time to get ’em soaking, folks. When you’re buying ‘fresh’ dried beans, get them from a good source for best results. There are some wonderful heirloom bean suppliers in the states, such as Rancho Gordo, Phipps Ranch, and Seed Savers Exchange. In Paris, I get mine from an épicerie that has a lot of turnover; La Grainerie du Marché d’Aligre, which is a favorite place to shop at. For this batch, I used the famed Haricots Tarbais, which are kind of pricey but have an especially rich flavor and since I don’t do drugs, I spend the money that I save on good dried beans. Haricots Tarbais start off ivory-white, but after an hour of so of simmering, they soften and take on a burnished caramel color, which gives the dip an extra boost of flavor. They cost about 5 times what other beans cost, so you don’t need to go as wacky as I did. (Although think of all the drugs I could buy if I bought crummy beans!) But yes, I have made this with supermarket dried beans, and it’s definitely much better with good ones. 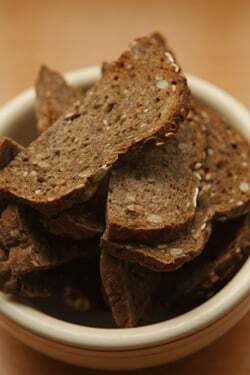 However canned beans will do in a pinch – it’s not the end of the world if you use them – and if you keep a tin in the pantry, with your chocolate, this is a great last-minute recipe to whiz together to serve before dinner with thin slices of toasted bread. I’m a fan of grainy breads, which work rather nicely with the bold flavors of the chopped herbs and the garlic used in this dip. But I’m hopelessly frugal as well, hence you’ll notice that I’m parsimonious with the oil mixed in the dip, but use it generously poured over the top, where it shines. Soaking the beans the night before drastically reduces the cooking time. And I’ll often cook extra beans, to maximize my energy-efficiency, and use them for soup. If using canned white beans, or making a big pot, you’ll need 2 cups (380g) of beans, drained for the dip.Reserve some of the liquid, as indicated in the recipe for making the dip. You can use whatever herbs you like. Fresh basil works quite well, as does sage, and tarragon would add a nice sharpness.Serve the dip with toasted slices of bread, or whole-grain crackers. 1. Rinse the dried beans and sort them, checking for stones or debris. Soak the beans overnight in cold water. 2. The next day, bring the beans to a gentle boil with a bay leaf, making sure there is plenty of water covering them. Cook until completely tender, 1 to 2 hours, depending on the beans. 3. Drain the beans, reserving some of the liquid. Puck out the bay leaf and let the beans cool until tepid. 4. Put the beans along with 1/4 cup (60ml) of their cooking liquid in a blender or food processor, and blend with the garlic, dill, mint, parsley, olive oil, lemon juice, salt, and red pepper powder. You’ll need to stop the machine a few times and scrape down the sides, but do puree it long enough for it to be completely smooth, which will take several minutes. Taste, and adjust for seasoning, adding more salt or olive oil if desired. If it’s too thick, add a tablespoon or so of the reserved bean liquid or olive oil. Garnish with a generous drizzle of olive oil and a scattering of fresh chopped herbs. You might want to try also to do a spread of roasted sunflower seeds blended with oil, garlic and goat-milk yoghurt. 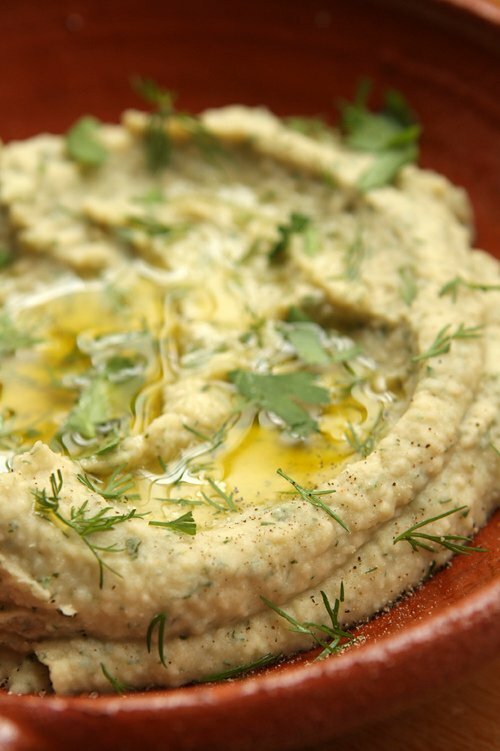 I can hardly believe that you’d never tried using white beans to make a dip! I love it made with butter beans, too. Great as the base for a non Mex tostada, too. Oh how I wish you had posted this yesterday so that I could have made it for the committee meeting I have tonight. But I fear I will have to throw together something a little quicker to prepare in between school runs, dinner and putting children to bed! Thank you, David, for this recipe! I have made bean dips before, but then forgot all about. I’ve been on a scratch bean dip kick for about a month now, and white beans are one of my favorites. I’ve also used your hummus recipe a few times now, and can vouch for its deliciousness. Your say no to drugs so you can say yes to good beans philosophy gave me my first hearty laugh of the day. Cook’s illustrated recommends adding salt to the soaking water. The sodium replaces some of the magnesium and calcium in the skins of the beans, making the skins softer and easier to cook. The salt also penetrates the beans seasoning them all the way through. On the other hand, some of the oligosaccharides in the beans which cause flatulence are extracted by the soaking process; the soaking water really should be discarded completely. I make bean dips regularly but never thought to add mint – will have to give it a go. I also like to make a thick version (only pureeing about 1/2 the beans) and spread between layers of very thin vegetable slices before baking. The French chef I work for sings the praises of these beans and wouldn’t dream of using anything else for his cassoulet. Customers balk about paying thirty bucks for a bowl of beans with a couple sausages and a bit of duck but they keep coming back for more. It must be the beans. I love white bean dips. My family’s favorite is one made with white beans, good canned tuna (packed in olive oil), lemon, garlic and dill. Delicious, nutritious and a lovely meal when set out with grainy bread and salad. I make white bean dip maybe once a month. I use my food processor. I have one variation that you might like: try roasting a head of garlic and sqeezing that into your dip instead of the raw stuff. It adds such a wonderful sweet flavor. I make something similar, and I put it on crostini with roasted red peppers on top, for a starter. I served it to our French neighbors, and they wanted the recipe–they simply could not believe it wasn’t full of heavy cream! But it does have a wonderfully rich flavor. Love your styling, with the drizzle of oil and herbs, beautiful. I make this once in awhile with a good handful of fresh rosemary and lots of black pepper. David, this sounds marvelous, but even better is the fact that I received your Ready for Dessert yesterday and salivated all night! Cannot wait to try some recipes! Thank you! Love your posts and find many good tips for shopping in France. I live half the year near Plougastel, in Brittany. Just one question: would the earth move from its orbit if I substituted a couple of cans of white beans and popped them in the blender? I feel an attack of laziness coming on and I’d really like to cheat a bit. I’d use expensive olive oil to compensate! How much of a sin would that be? Bean dips are great, even with tinned beans. Something totally different about soaking and cooking the beans from scratch though. Something I did the other day was take a bean dip as such, added some pasta water to thin it out and used it as a pasta sauce. It was really good. I rather spend money on good food than drugs too. Another slothful canned bean question. If I were (horror) to make this with canned beans which seem to be cloning in my pantry would I use a 1 part dry:3 part cooked conversion?That would be guess, a bit more than one can. Does that make sense? Sometimes I wish you would come cook for me. Is that wrong? Well at the very least I can go buy some good olive oil and try this out! Nice idea and very cool pictures of what can look very dull. 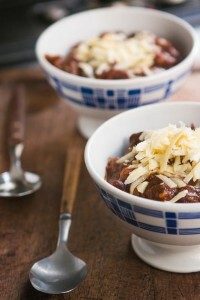 I’m going to make that with cocos de Paimpol which I just love. I’ve never seen haricots Tarbais here, although I live close to La Rochelle which has close ties to the Pyrenees – I believe ETA had their HQ in La Rochelle for quite a while!. Randy: Some say that salt prevents the beans from softening, which is odd because I add bacon sometimes to beans that are simmering, and it doesn’t seem to affect them. Thanks for the reference! carol and Elizabeth: You can use canned beans, and I gave guidance for quanties of cooked beans, for that reason. Nancy: Glad you got the book – enjoy! Katie: I like roasted garlic. Next time, I’ll give that a try. Appreciate the tip..
meg: Meant to post the recipe earlier, but realized that I hadn’t written it (!) Then I realized that I needed to do the metrics for the quantity of beans cooked and uncooked, so I remade it today before posting..and I had it for lunch! Another delicious addition to a white been dip is to tumble a small skillet-full of flash-sauteed, blistery, cherry tomatoes over the top. Thanks for the reminder to put this on my upcoming menus, and to use my beans soon! Nice recipe. I agree that good beans make a huge difference (I buy Rancho Gordo almost exclusively). One note I would like to add – using Extra Virgin olive oil in a blender / processor could lead to a bitter tasting dish. Rapid emulsion in a blender can break down fatty acids coating the bitter tasting polyphenols in extra virgin olive oil. This doesn’t seem to happen with regular olive oil, so you can blend with regular oil and finish with a nice EVOO. This also doesn’t happen with hand whisking, just rapid emulsion. 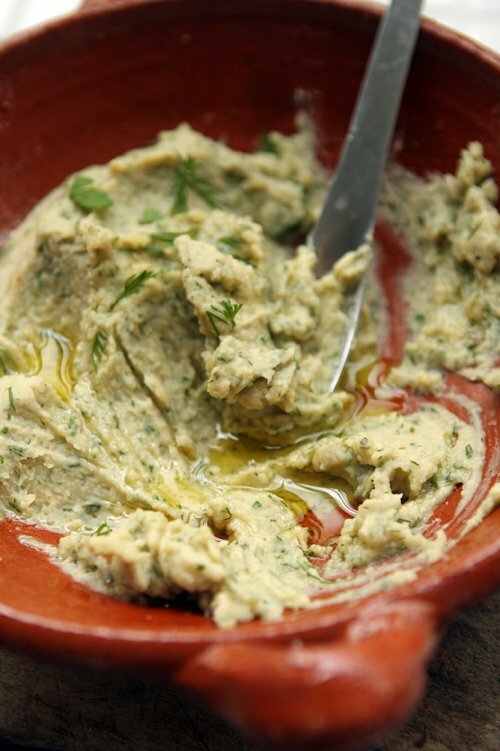 For a party at our municipal bathing beach last summer, I made a white bean dip with cannellini. It kept tasting bland until eureka–I added a LITTLE Meyer lemon-infused olive oil that I’d bought at a farmer’s market. The flavor really popped. That bowl was wiped clean with raw veggies. Awesome – never had white bean dip before and this looks soooo good. Good suggestions on picking beans, now I know which I use. Another great post! Love the tweet about buttering a pan as well. Olive oil…huge topic. I agree about the comparison of good wine and evoo! Have you read Extra Virginity? Easy read and very informative. My Love and I are currently traipsing through the european countryside in hot pursuit of delicious wine and oil – will let you know if we find a gem. Thanks again for a lovely antipasti idea! I love beans and I prefer starting from dry whenever possible. I recently started using a new “no soaking” method a friend told me about and I have been THRILLED with the results. I now do beans in the oven. Yes, the oven. It’s easy, takes much less time and no advance planning. Any suggestions for a substitute bean? I’m picky about quality, and won’t find those where I live. I agree about the olive oil. If calories are not an issue, the dip is delicious with a topping of caramelized onions mixed with a little tomato paste and a little sugar. 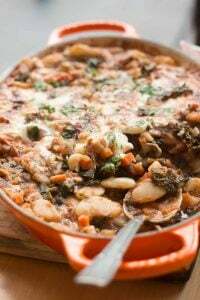 Nice recipe– I make a similar one with Meyer lemon and rosemary– and your absolutely right about the importance of the quality of beans. Haricot Tarbais beans are available online from D’Artagnan. They’re expensive but so are Rancho Gordo and Phipps (also online) and the differences between these and the $1.89 bags of beans at the supermarket are a revelation. I’d recommend Phipp’s Italian Butter beans. Here in SF, I’m in love with the meaty white beans from Iacopi Farms at the Ferry Plaza Market on Saturdays– an old Italian, unnamed variety that are really sublime. Iacopi Farms is a third (or fourth) generation family of farmers who also grow wonderful cranberry beans, peas, artichokes and Brussels sprouts in Half Moon Bay. Pam: That’s a terrific idea about the tomatoes! Phillip & Roger: The Haricots Tarbais are quite good, although I’m not sure they are worth the fortune that they sometimes cost. Steve Sando from Rancho Gordo said that he has been growing them, so it might be interesting to take a look at his site. 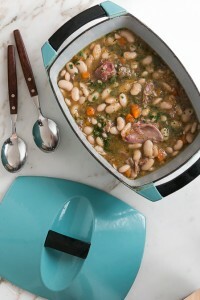 Italian Girl Cooks: And good quality white bean. Natural food stores are good places to look for beans, or some of the vendors that I listed in the post are reliably good. Angela: That is interesting, although they say it takes 1-2 hrs, so am not sure that’s much of a time-saver. However that is without pre-soaking, so might be worth trying. Some people use slow cookers and pressure cookers, although Steve Sando (once again, since he’s the bean expert!) isn’t fond of using one for beans because there is no reduction of the bean juices, which are really flavorful. RussC: I didn’t know that – there’s a pretty small amount of oil in the purée so I didn’t notice any bitterness but interesting! Hello David, I’m a big fan of your blog and books from Greece… and I wanted to ask if you know when your book “Ready for dessert” will be on Amazon co.uk? And now I know what I am cooking this weekend…. It’s interesting that more men responded to this recipe than usual. Guys are into beans? The way to a man’s heart: bean dip! I love the garlic and herbs you added here, how delicious! 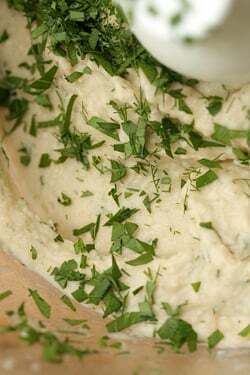 I love a good white bean dip, but have not made one in a long time. Will have to try yours. May even splurge for really good beans since, well, I don’t do drugs and you’re right. Why not allocate that unused drug money to some quality beans? I just want to have some now ! I prefer using canned beans, rinsed and drained. Recently I began buying Rancho Gordo after a mention in Ruhlman’s blog. The difference is amazing. Even after a few days in the fridge after cooking. For a pound of them, I used the slow cooker. Had to add more liquid (water I believe) after about 5 hours. Have to make only a half-pound next time. Sweetie was tired of them by the third day. Heirloom beans rock! This sounds, and looks, amazing. I can image sitting around drinking a glass of wine sharing a rustic bowl of this delicious spread. Very nice indeed! oh yes this variation sounds great I find this Dip such a great appetizer instead of filling up with cheese and biscuits which my partner indulges every night before dinner! A nice addition is an anchovy and sometimes I add a chilly for bite. So nice with crudities -crunchy celery from my garden and carrot sticks. LMAO – glad you put your “drug money” to good use – beans! Me too! Why haven’t I tried beans for a dip? This is a must this week!! David – I know you don’t own a pressure cooker (you mentioned it before), but there is nothing better for cooking beans. 5 minute pre-soak, then 10-20 min cooking time (depending on amount of tenderness desired). I recently did a version of cassoulet, starting it with the pressure cooker and ended up with about an hour in the oven. It was one of the best I’ve made. Total time was about 2-2 1/2 hours, starting from dried beans! I did this in a Fagor 4 quart pressure cooker. I also have an 8 quart I use mostly for making stock. Try adding artichoke hearts to this dip, along with some good parmesan cheese and lemon juice and zest. It’s always a hit whenever I serve it. White bean eater, never a maker until now. Today, I reached for a bag of dried Cannellini beans at my local marché with a mind to make it, and thought I’d find a recipe on your blog, only to find it was THE recipe of the day. Thank you, you read my mind! Oh my, that looks so delicious. I love dips with pita chips! Hah. I love the ” ..I don’t do drugs..” justification…exactly what I told my friend when she asked me why I spend money on cheeses. I admit to being the most terrible vegetarian in the world – I hate eating beans. I’m slowly warming up to the idea but they are just. i don’t know. gaseous? 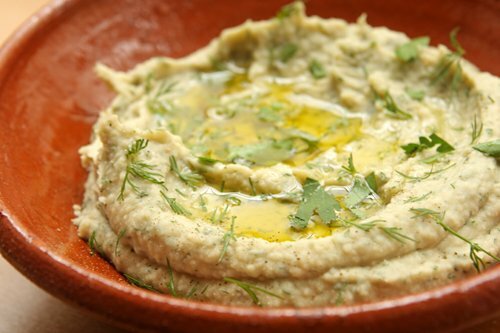 I prefer baba ganoush which is what this looks like so maybe I can meet you half way with a white bean dip and baba ganoush combo! I love white bean dip. Delicious with chicken, or as a dip for veggies, and many many more things as well. Yours looks great. For people that want to make their own “from scratch” beans, you can freeze them when they are cooked. One of the money saving cooking shows suggested cooking the whole bag of dried beans in the slow cooker, then portioning out “one can’s worth” into plastic freezer bags and freezing the bags flat to save space. I just don’t remember what the equivalent is for a one can portion. I love finding new ways to use beans . . . after a while they start to seem bland. Thanks for this great idea! Read this bit to my beau – “kind of pricey but have an especially rich flavor and since I don’t do drugs, I spend the money that I save on good dried beans” and he said it sounded like the beginnings of a modern fairy tale. Beans, one of the best, most versatile vegetables out there. I’m always looking for good bean recipes – thanks. when making white bean dip i give the beans a short spin in the food processor on their own, then add 20 to 30 kalamata olives (pits removed) and a good amount of rosemary, and puree until smooth. You’re answering to one question I asked to myself today : what kind of dish could I make with white bean ! It seems very good. It make me think about Houmous, do you know it ? I have made a white bean mash using any white beans, but usually cannellini beans. They can be mixed together with some olive oil, salt and cracked pepper, and then heated to be served instead of mashed potato. Mmmm….beans! Boil em, mash em, bake em, -throw them in a soup! They really are magical. ; ) You really cracked me up when you said that since you don’t do drugs, you spend the extra money on good beans. We all have our priorities! Very happy to have this recipe – this is one of those snacks I love to order at a restaurant and never get around to making at home. Thank you! I second the suggestion to add salt to the soaking water–1T/qt. 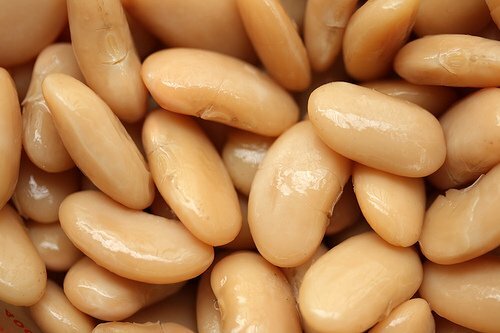 It is the very best way to keep the bean skins from splitting and getting mushy (obviously not an issue when you’re making bean dip, but for other applications…) and it boosts the wonderful beany flavor of those great beans you invested your drug money in. After trying so many different ways of cooking beans over the years, I have settled on a favorite–soaked in salt water overnight, then cooked on low heat on the stovetop 1-2 hrs (depending on the bean). I gave up on the pressure cooker years ago because I could never get my beans quite perfect. they were always over or under done and between waiting for it to come to pressure, then regulating the heat to maintain pressure then waiting for it to de-pressurize, I never saved any time. I like this with some smoked paprika as well! Gives it a satisfying smokiness. Hello David, Have you heard OF PERUANO BEANS? Hello David, Have you heard of peruvian beans called peruanos? They are delicious, very soft and creamy. I usually soak 4 C overnight, and place them in a crock pot the next morning with 6 C of water, lots of garlic, dried herbes de Provence, basil, and sage, several bay leaves, and dried onion flakes. I turn the pot on high for 3 hrs and then on low for the next 8 hrs. Great beans! Perfect appetizer! Easy and quick to make. I’ve skimmed through countless recipes calling for proper treatment of beans and I usually shrug and click on. This recipe, though, caught my attention like no other. This dip looks amazing and I am already fantasizing about it as a spread for a weekday sandwich. I very much like dips as well as white beans. And I never made a white bean dip – should change that. When looking on your lovely photos I feel I definitely should change that. I LOVE mint and dill together. And white beans. And dips. And white bean dips. This is perfect. Just plain delicious. Simplicity at it’s best. If you are in France or England do whatever you can to get your hands on a bottle of Le Garde-Manger De La Falaise organic garlic olive oil and splash some on top. You will think you have died and gone to heaven! When it’s too hot to cook, I open a can of white beans (navy beans seem to be the creamiest) and make a version of this for dinner. Bean dip, baguette, and a glass of rose – yum! Nirvana on a fork, a chip, or a cracker…pure genius. Where can I find nice bread like in the photo in Paris? Our local Farmer’s Market sells fresh cannellini shelling beans – no soaking and they cook in about 20 minutes. The beauty is you can freeze them. Just shell them and place the beans in a freezer bag and freeze. Thaw to use. Voila, fresh beans. They truly are better than a dried bean. Totally agree with you about the olive oil thing. Why are people so resistant to spending money on such an important ingredient? The flavor is so much better! This sounds great. I do something similar, and add Parmigiano Reggiano to the mix. Love to see all the bean inspiration here! Since we talked about beans for cassoulet when you were down, I might mention that I often make a ‘cassoulet dip’ with my leftovers- using a bit of duck fat (what else!) and the stock from the bean broth. In addition to the Tarbais (French runner beans) and Coco I use, Borlotti and Cranberry beans work. And yes, I, too, defer to Steve Sando (the Bean God) and use his straight from soaking to cooking method. Bean freshness is the key! 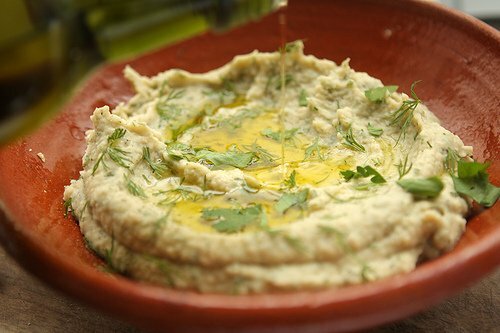 Had a wonderful get together this past weekend….made your white bean dip. It was wonderful…delish!…and a big hit. Thanks for sharing. This looks so delicious and divine :) I love how the consistency appears so smooth and creamy. I would have thought a bean based dip would be more chunky. Love a bean dip, white bean, broad bean. Thanks for all the suggestions from other comments. Another Good Thing is to toast some cumin seeds and sprinkle them (cooled) over the top of the white bean dip. This dip looks so good. I will try it this weekend! Very true about the olive oil, it’s an investment! That’s the thing about beans of just about any type, they are healthy and delicious and you can make bean dip or hummus with just about any bean in the world. This looks just delicious. 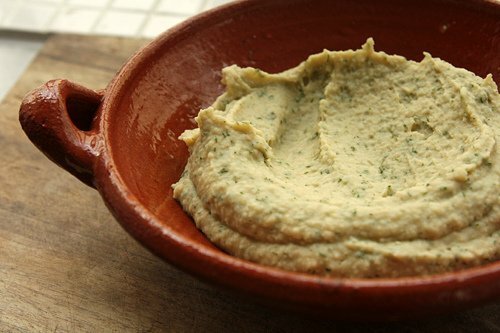 I have made white bean dip myself but I add chipotle pepper to it or a puree of shallot, garlic and rosemary and thyme! Just delicious! really a good therapy . I will consult this recipe to my chef . There is a really wonderful white bean dip recipe using rosemary-infused oil in Heidi Swanson’s Super Natural Everyday cookbook. I love it. I’ve avoided white bean dip for exactly the same reason, I thought it would be bland, so I will definitely have to try this. Also, people do not use the word parsimonious enough, thanks for bucking the trend! I make a similar dip without the mint & add cumin. Spread it on Naan bread topped with whatever cheese I feel like having & make a pizza out of it.. Add some onions & artichokes on top. Allergic to tomato sauce so the white beans are a great substitute sauce. We prepare it out of self cooked beans or canned, . Our Romanian version from the north – Transilvania: Giant White Beans, onion, white vinegar, salt, black pepper. A little cooking water if needed, and simple oil (not olive). Try it! on a toast or good Poilane bread. I just made it and I love it.